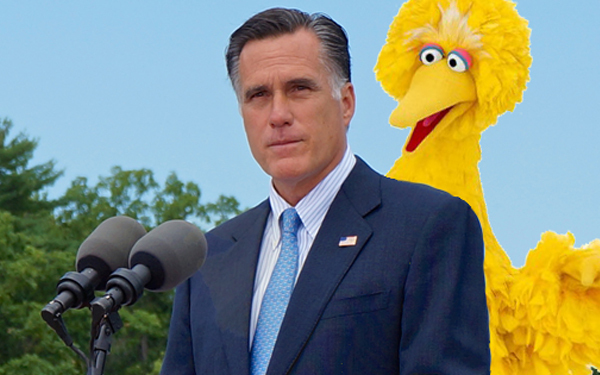 *Mitt Romney may rue the day he told the world , during the first presidential debate on Oct. 3, that he was going to kill Big Bird, “Sesame Street” and the Public Broadcasting Service or PBS. Yes Mitt, you done messed with the wrong bird this time and you’re about to pay the price, reports Reuters. The demonstration is planned for November 3 at the National Mall in Washington, D.C., three days before the general election. Before the presidential debate between Democratic President Barack Obama and Republican challenger Mitt Romney had concluded on October 3, two men who had never met each floated the Million Muppet March idea on social media. They immediately united to defend public broadcasting. Romney pledged during the debate to end the U.S. federal government’s subsidy for the Public Broadcasting Service despite his professed love for Big Bird, one of the characters on PBS’s 43-year-old children’s educational program “Sesame Street,” which features the Muppets. Big Bird, played by actor Carroll Spinney in an 8-foot (2.5-metre) bird costume, is strictly speaking not a member of the group of puppet characters known as the Muppets. Bellavia bought the Internet address www.millionmuppetmarch.com during the debate and discovered Mecham had already started a Facebook page by the same name.